Apples are a traditional symbol for autumn – and for school! The fruit was celebrated at the third annual Woodstock Apple Festival, in the parking lot behind Woodstock's Chase Bank on Sunday, October first – held concurrently with the adjacent Woodstock Farmers Market behind the KeyBank – with the apple event benefitting the Shu-Ren Chinese Immersion Program at Woodstock Elementary School. Apple Festival organizers Scott Farestrand and Kelli George, parents of children enrolled in the program, were pleased with the turnout. "Funds are slated for school supplies, scholarships, and the eighth grade trip to China," revealed Farestrand. "Although there's intermittent rain today, we seem to be doing all right this year. These first three festivals have been a learning experience. "We're selling seven different varieties of apple that come straight from a farm in Hood River. The fresh cider we're selling here is being made with help of students." Seven classrooms participated, as well as vendor booths selling honey, raffle tickets, books, and other items. An apple-red Bouncy Castle in the corner of the parking lot did a brisk business entertaining active children as parents shopped. Woodstock School seventh graders sold caramel apples with a variety of toppings, while first graders offered a beanbag toss event. Other classes manned snack and popcorn ball concessions, and helped sell bags of apples from large wooden crates. The cider-making tent drew much interest, fascinating onlookers with the old-fashioned process. 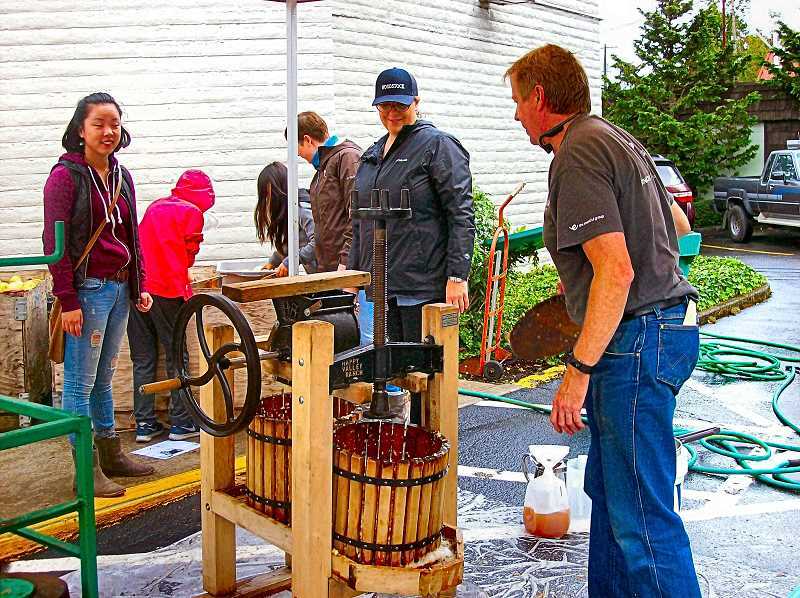 An efficient system of cutting apples, pressing them with a heavy screw system, then straining, bottling, and selling the resultant cider, displayed farm-to-market organization. Visitors told THE BEE it was fun to observe the process first-hand, and even have a turn at the wooden press. Some acknowledged logistic problems at last year's Apple Festival were resolved and did not repeat this year, and organizers are looking forward to an even bigger and better Apple Festival fundraiser next year.